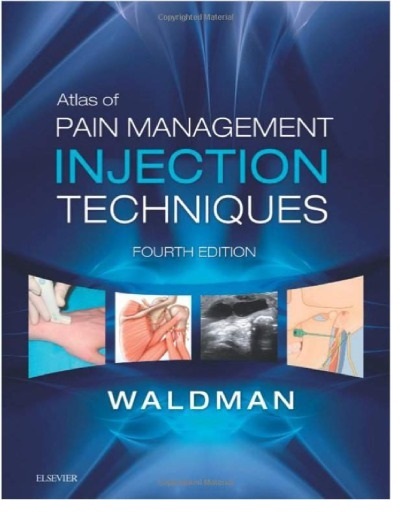 Focusing on the "how-to" details of pain management injection techniques, this best-selling atlas helps you master the key nerve blocks you need to know to successfully treat common and uncommon pain syndromes. Nearly 200 joint and muscular injections, as well as 30 brand-new injection techniques, are presented in a highly illustrated, easy-to-follow format. Dr. Steven D. Waldman walks you through every essential pain management procedure used today – from the head and neck to the foot and ankle, and everywhere in between. Shows exactly how to evaluate the causes of pain, identify the most promising injection technique, locate the injection site with precision, and deliver effective pain relief to your patients. Helps you find what you need quickly with a logical organization by anatomic region, and templated chapters that cover indications and clinical considerations, clinically relevant anatomy, technique, side effects and complications, and Dr. Waldman’s own clinical pearls. Focuses on the "how" rather than the "why" of office-based procedures, including greatly expanded ultrasound content that includes illustrations showing proper transducer placement, patient positioning, and ultrasound images. Includes 30 brand-new injection techniques, including Greater Auricular Nerve Block, Genicular Nerve Block, Medial Cutaneous Nerve Block, Digital Nerve Block of the Thumb, Sacral Nerve Block, Injection Technique For Plantar Fasciitis, and many more. Features new full color drawings that show appropriate needle placement and trajectory used to reach each target, as well as photographs, radiographs, ultrasound, CT, and MRI images throughout.